I think all the required extensions aside from Tile Map can be found in the extension manager. 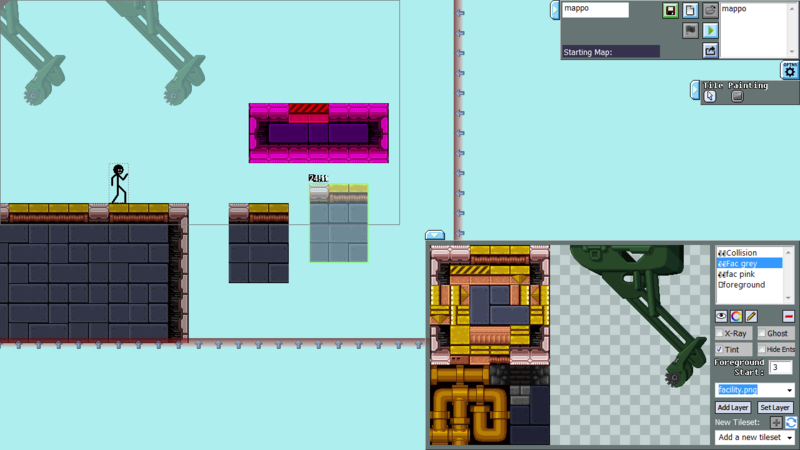 This level editor lets you create and select mods with a custom menu, manage many, many aspects of your map tile sets, create multiple layers, change their tints, set invisible collisions, create and handle maps, as well as run them right from the editor with command lines. "The free hosting period for this file has now expired, only premium users can download it." Let me know if that also fails eventually. Very cool! Thanks for making this and sharing it with the community. I'm unable to download the "Dialog Box" extension for Fusion 2.5 since I don't have the developer version, and therefore I'm unable to open the "MakerExample.mfa" file. Would it be possible for you to find a way to create a version without the Dialog Box extension? Hi Dustin, I'm looking for a level editor and this looks perfect!! I tried downloading but it keeps crashing when I try to open it. The furthest I got was trying to open the event handler, but it crashed again. Is there a more recent version I could use? Can somebody please reupload this? Tips for a tile selector in a level editor? How to assign SolarB's level editor in my own frame and for tile size 24x24? Looki's Tilemap Extension - Examples? Documents?